Displays the path to the file from the application package. 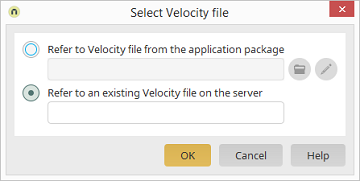 All Velocity files from the application package are stored in the portal directory internal/application/store/<AppGuid>/resources. Opens the Velocity file manager where a Velocity file can be selected. Opens the Script editor where the current Velocity file can be edited. Displays the path to the file on the server. Please take note of our security notice when using Velocity files.